Leaders of a military coup in Mauritania today promised to hold a ''free and transparent'' presidential election as soon as possible, defying foreign calls to reinstate the country's first freely elected President. About 2,000 Tibetans and their Nepali supporters took part in anti-China protests here today, a day before the Olympic Games open in Beijing. Shaven-headed nuns in saffron and monks in burgundy robes were among protesters who staged a peaceful demonstration in a Kathmandu suburb. An allegation that some members of Parliament had been paid Rs 25 million each to vote for President Pervez Musharraf as President created ruckus in the upper house here. MMA’s Kamran Murtaza said on October 6 when Musharraf sought election from outgoing assemblies for another five-year term, many MPs were paid Rs 25 million each to vote for him. The United Nations (UN) has reopened its offices in the capital after two months’ closure over security concerns. The offices were closed down after a car bomb had exploded outside the Danish embassy in Islamabad in June. Asif Ali Zardari, head of Pakistan's ruling coalition, warned President Pervez Musharraf on Thursday against dismissing Parliament after the coalition decided to begin impeachment proceedings against him. Soldiers ousted President Sidi Mohamed Ould Cheikh Abdallahi yesterday after he tried to dismiss military chiefs widely suspected of supporting the president's opponents in a political crisis in Africa's newest oil producer. It was Africa's first successful coup since some of the same soldiers ousted the Islamic republic's previous president three years and three days earlier, and it drew international condemnation and demands for Abdallahi's return. But many local politicians threw their weight behind the coup. Some planned a march today in support of the ''High State Council'' set up by presidential guard chief Mohamed Ould Abdelaziz, who led the coup after Abdallahi tried to sack him. The 11-strong junta said it would work with Mauritanian politicians and civic groups to organise a presidential election ''to renew the democratic process on a sustainable basis”. ''These elections, which will be organised in as short a time as possible, will be free and transparent,'' it said in a statement published by national news agency AMI. The council pledged to respect treaties and other commitments binding Mauritania, which spans Arab and black Africa at the western edge of the Sahara and has close ties with many Arab states. It is also one of the few Arab countries to have diplomatic relations with Israel. Abdallahi, who was arrested yesterday with his prime minister and interior minister, won elections last year after a 2005 coup, also instigated by Abdelaziz, which ended years of dictatorship under President Maaouya Ould Sid'Ahmed Taya. About 2,000 Tibetans and their Nepali supporters took part in anti-China protests here today, a day before the Olympic Games open in Beijing. Shaven-headed nuns in saffron and monks in burgundy robes were among protesters who staged a peaceful demonstration in a Kathmandu suburb. Many held strings of beads and hummed prayers for ''world peace'', sitting in an open field as dozens of police kept watch. ''Many Tibetans, including monks and nuns, are tortured and imprisoned by China,'' said Karma, a 54-year-old nun, holding a yellow and white Buddhist flag. ''We are protesting for their release and appealing to the international community to help release these religious people,'' she said. More than 20,000 Tibetan refugees live in Nepal since they fled their homeland following a failed uprising against the Chinese rule in 1959. They have been holding regular protests after deadly anti-government riots broke out in the Tibetan capital Lhasa and other areas in China mid-March. Protesters carried the Nepali national flag and Buddhist flags.They wore yellow jackets which read ''Long live His Holiness, the Dalai Lama'' and ''Stop cultural genocide in Tibet''. An allegation that some members of Parliament had been paid Rs 25 million each to vote for President Pervez Musharraf as President created ruckus in the upper house here. MMA’s Kamran Murtaza said on October 6 when Musharraf sought election from outgoing assemblies for another five-year term, many MPs were paid Rs 25 million each to vote for him. While the Opposition boycotted the poll, Musharraf wanted to ensure that he gets majority votes. Those who had gone abroad were told to come back while the sick were brought from hospitals. Murtaza, while claiming that he had evidence, said he was prepared to divulge all the names in the Senate. But Senator Safdar Abbaasi ruled that. Murtaza could provide the names to a panel of the senate after some senators said their privilege had been breached because Murtaza had put in doubt integrity of every senator. Senator Pari Gul Agha (PML-Q) moved a privilege motion and demanded proof from Murtaza, who insisted that he stood by his statement. Meanwhile, Senate Standing Committee on Information and Broadcasting chairman Liaquat Bangalzai sought to move a privilege motion against Pakistan Broadcasting Corporation (PBC) director general Ghulam Murtaza Solangi that he made a telephone call to Solangi as he wanted to discuss a matter relating to the PBC. Solangi did not respond. Solangi explained in writing that the senator had asked him to appoint his nominee in radio station in his constituency which he did but later also asked him to provide an official residence to him which he had no authority to do and declined. The United Nations (UN) has reopened its offices in the capital after two months’ closure over security concerns. The offices were closed down after a car bomb had exploded outside the Danish embassy in Islamabad in June. A UNDP office located near the embassy was also damaged in the blast. “All 22 UN offices in Islamabad have resumed operations,” an official of the UN mission here said. He stated that security at all UN offices had been reviewed after the embassy blast and a threatening phone call to a UN office in July. The official said UN security teams had flown in to revise security measures. On the basis of their reports, the UN mission had decided to resume work. Most of the offices are located in residential areas of the capital. The capital development authority has advised the UN and other foreign missions to shift their offices in Diplomatic Enclave for security reasons. 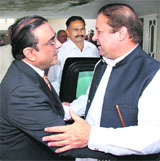 Zardari asserted that he was not worried by speculation that Musharraf might use Article 52-B of the Constitution empowering the President to dissolve the Assembly. "If he does it, it will be his last verdict against the people, against the people's mandate and against Pakistan," Zardari told a news conference.